The readings from the Revised Common Lectionary for Sunday worship include an Old Testament reading, a reading from the Psalms, an Epistle reading, and a reading from one of the Gospels. Which one of these should the preacher focus on? The obvious answer would be the Gospel reading. Certainly the Gospel is essential to the sermon or homily. Nonetheless, the ‘Gospel reading needs to be seen in the broader context of the supportive readings: Old Testament, Psalm, and Epistle. Often the best commentaries on a verse of scripture are other verses of scripture. 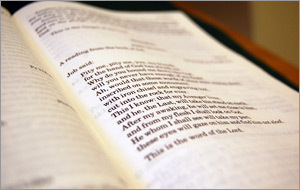 The authors of the lectionary have done an excellent job of assembling complementary readings each week. The connection between the appointed readings may not always seem apparent. However, with prayer and reflection an overall theme will begin to emerge. Discovering this theme is an exciting process. We will trust God and approach the readings with joyful expectation. We will begin early in the week and let the readings resonate within us as we approach each daily task. They will provide guidance and strength. As we listen to the still small voice of God within He will guide us in our understanding of the readings and how they are related. If we are focusing on what we want to say in the sermon we may miss out. Let us discover what God wants to say and let Him have His way. He will breathe life into the sermon – His life.